Cardiff has two very different coffee spots within a stone’s throw of each other, right in the heart of the city. One is the delightful Coffee Barker in the Castle Arcade, with its all-devouring sofas, and the other is today’s Coffee Spot, the outstanding Plan Café Bar, over in the Morgan Arcade. The Plan is rightfully proud of its coffee heritage and is leading the way in speciality coffee in Cardiff. It can boast, in head barista Trevor, a UK Barista Championship finalist, and the café itself can (and does) make much of its appearances in the Guardian and Independent’s top 50 cafés lists. It’s also in a stunningly good location for a café, right in the middle of the Morgan Arcade. Frankly, if I was choosing a spot for a café, I’m not sure I could have done better. The coffee is from James’ Gourmet Coffee in Ross-on-Wye and, in a move surely designed to win me over, the usual espresso-based range is supplemented by a cafetiere option. Add to that the fact that my tea-drinking friend, Kate, raves about it (although her focus is mostly on the scrummy pancakes) and you know you are onto a winner. I have a cunning plan, m’Lord… I’m going to find the perfect spot for a café: a restored Victorian Arcade, the bit where two branches come together to form a Y, with a building in the centre. It will be standalone, have windows all the way around, two floors and a central skylight. Damn! The Plan got there before me! Despite being the perfect location, The Plan is a weird shape. I’d say a hexagon, only it’s more like a square with two corners cut off. Downstairs is great, with tables by the windows and in the middle of the room, plus a few more squeezed into odd nooks and crannies by the doors. I’m told it’s very wheelchair-friendly. However, the best bit for me is upstairs (although this is not wheelchair-accessible, the only access being a staircase at the back), where a balcony surrounds a central light-well, connecting it to the floor below. Pride of place goes to a lovely, two-tier, circular iron chandelier, complete with candles, hanging in the centre of the light-well, providing a focal point for the whole café. Of course, this wouldn’t matter if the arcade itself is gloomy. Fortunately, the Morgan Arcade is anything but, with generous skylights letting in plenty of light, which in turn floods into The Plan. Regular readers will know that I love a good balcony, so naturally I sat upstairs, although I suspect I would have been equally happy in any of the nooks and crannies down below. I’m aware that in writing this, I’m really not doing it justice. Like Coffee Barker, my photos do a better job of describing the layout than I do. Anyway, onto the coffee. Naturally I went for the cafetiere option, where the single-origin beans on offer from James Gourmet Coffee rotate on a regular basis, depending on what’s in season. If you need any advice, don’t hesitate to have a chat with head-barista Trevor, if he’s there. He’s very friendly and will talk forever about coffee if given the chance. I had a choice of a Columbian (Santa Barbara) or a Rwandan (Koakaka Cooperative); along with a decaf option. The Rwandan sounded a little too adventurous, so I had the Columbian and wasn’t disappointed. 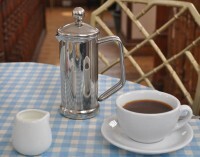 It’s rare for me to like cafetiere coffee enough to drink it without milk, but the little jug which came on the side proved entirely unnecessary, the Columbian providing a full-bodied but subtle drink. I would have liked to try the espresso blend, which also changes on a seasonal basis. During my visit, it was an interesting mix of Sidamo Ethiopian and Guatemalan beans, but alas, I was already at my caffeine limit for the day and had to forgo that pleasure. Once again, I was with my non-coffee drinking friend, Kate, who had made a trip to The Plan a condition of my visit to Cardiff. The highlight, and what we had denied ourselves cake for earlier on in the day at Waterloo Tea was the banana, chocolate and butterscotch pancake, served, naturally enough, with vanilla ice cream. Kate had already warned me about the pancakes’ filling nature, so we sensibly decided to share. Suffice to say that we were not disappointed either by the quantity or quality of what was on offer. If you enjoyed this Coffee Spot, check out the rest of Cardiff’s speciality coffee scene with the Coffee Spot Guide to Cardiff. This entry was posted in Cafes, Cake, Cardiff, Lunch, Victorian Arcades and tagged include by Brian Williams. Bookmark the permalink. The Plan was the first coffee stop in Cardiff that I really fell in love with. It is the setting which first attracted me, the lovely selection of teas second and the home made simple but delicious food third. Outside of all those it is also, despite the shape and size, relatively easy to get my son in his wheelchair into a table space downstairs, something many bigger places fail on. really nice, I have a friend moving to cardiff later this year. will recommend this one to her!